00:41 | Over 600,000 people have visited the royal crematorium and exhibition at Sanam Luang during the first 11 days it has been opened to the public. 03:14 | Deputy prime minister General Prawit Wongsuwan said he has not yet been informed on the composition of any Cabinet reshuffle, while denying that he has been making suggestion for various posts. He added that the government will likely allow local elections to be held before the ban on political activities is lifted. General Prawit also said that the government is now taking action against transnational criminals and influential groups nationwide, including accusations of extortion and bribery by some police in Phuket. 04:38 | Maldives government officials have visited Thailand to learn about its election system and processes ahead of its 2019 presidential elections. The Maldives delegation invited Thai officials to observe its election. 06:06 | Thailand’s deputy prime minister for infrastructure, Air Chief Marshal Prajin Juntong, has attended a meeting on collecting water data as part of the government’s efforts to address water management. The data is being collected over 30 months from March this year until September 2019. 07:34 | Assistance is being provided to residents in ten flood-affected provinces in the north, northeast and central plains, while preparations are being made to prevent flooding in the South. In Phatthalung Province corrals have been built to keep buffalo mustered on high ground. 09:27 | Deputy prime minister for security affairs, General Prawit Wongsuwan, has called for enhanced anti-human trafficking and forced labor efforts, and for corruption to be eradicated from the civil service. A committee is drafting a Trafficking in Persons (TRIP) Report for 2017 and will meet to review it on November 15 so that it may be finalised in December and forwarded to the United States by January 31, 2018. Meanwhile, European Union (EU) representatives are currently reviewing Thailand’s compliance with Illegal, Unreported and Unregulated Fishing (IUU). Thailand received a ‘yellow card’ from the EU in April 2015 at which time it was given 12 months to conform. 11:15 | The Immigration Bureau is to be more vigilant in pursuing people who overstay their visa after about 100,000 foreigners were found to be in Thailand illegally. It plans to coordinate with the Department of Consular Affairs to tighten visa issuance in countries with poor overstay records. 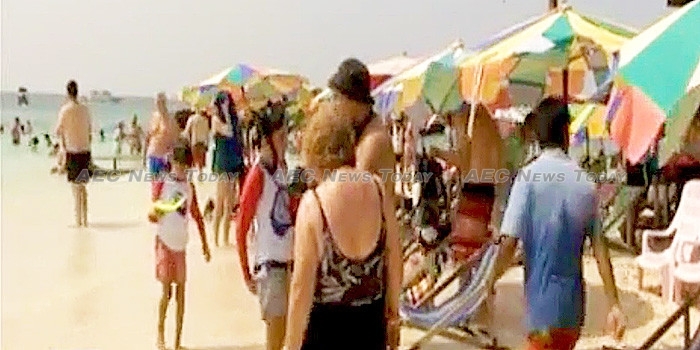 In Phuket authorities arrested over 100 visa violators. 14:46 | Representative of rubber growers have met with the Minister of the Ministry of Agriculture and Cooperatives (MAC), General Chatchai Sarikalya, to complain about the governor of the Rubber Authority of Thailand (Rat). The minister said that a committee will be established to probe the governor. 16:27 | Newsline takes a look at the 200-year-old Wat Naosao temple in Nan Province. 19:13 | Prime Minister General Prayut Chan-o-cha is holding talks with leaders of Asean and dialogue partners during the 31st Asean Summit in the Philippines. This year, the summit is focus on building a people-centered Asean Community as well as promoting regional peace, maritime security cooperation and culture-led economic development. 21:44 | Newsline looks at the economic potential of Chiang Rai and why investors are finding the Special Economic Zone (SEZ) attractive.